PRINCETON, NJ -- Even as access to the Internet has become ubiquitous in the U.S. and data analytics is highly touted for use in finance, U.S. investors are more likely to have a dedicated financial adviser than to use a financial website for obtaining advice on investing or planning for their retirement, 44% vs. 20%. 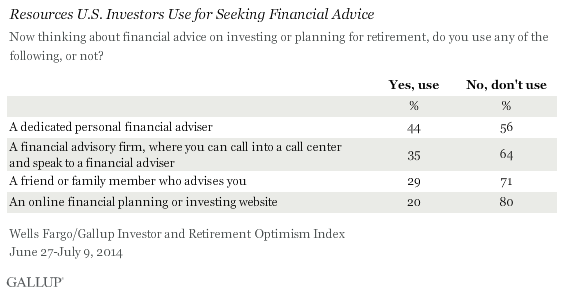 More investors also report using either a financial advisory firm that gives them access to live advice through a call center (35%) or a friend or family member (29%) to advise them than using a financial website. 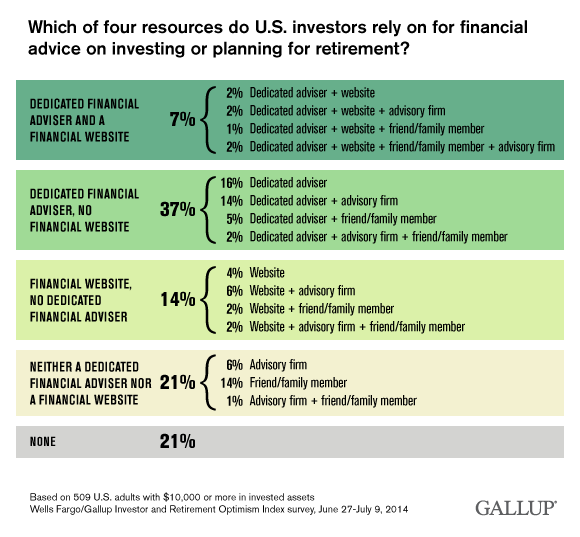 Among U.S. investors, retirees and investors with $100,000 or more in invested assets are significantly more likely than their counterparts to use a dedicated financial adviser. Nonretirees are more likely than retirees to use financial websites or to rely on friends and family. Men and women are about equally likely to report using three of the four advice resources. The exception is financial websites, which men are about twice as likely as women to say they use, 25% vs. 14%. 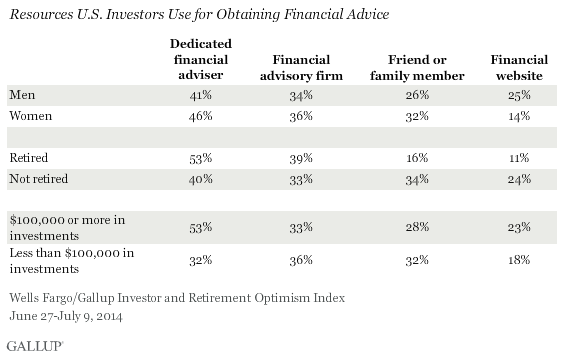 There is little difference across types of investors in the use of financial advisory firms, with about a third of each demographic group saying they use one. Overall, 79% of investors report using at least one of the four financial advice resources tested, while 21% don't use any of the four. The largest percentage of investors -- 40% -- rely on just one source, but almost a third (30%) rely on two, 7% on three, and 2% on all four. The following chart details how investors fall into all 16 possible combinations of the four resources. Of particular note is that many more investors rely on a financial adviser to the exclusion of a financial website than the reverse: 37% vs. 14%. Only 7% rely on both, either alone or in combination with other resources. 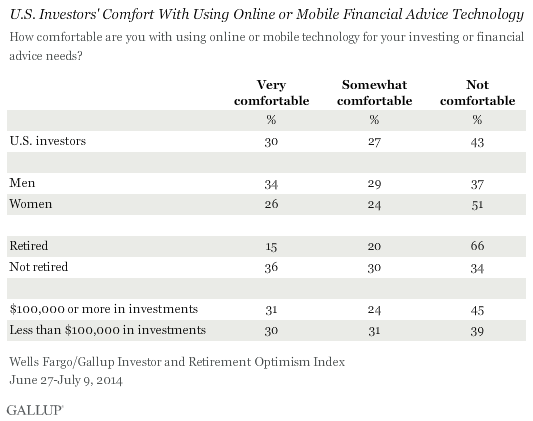 Part of what may be suppressing investors' use of online financial resources is that less than a third of investors -- 30% -- say they are "very comfortable" using online or mobile technology for their investing or financial advice needs. While another 27% are somewhat comfortable, 43% say they are not comfortable with this. This shouldn't be an either-or situation. Investors who want the best of both worlds can probably get it by seeking a partnership with financial advisers who are tapping into the same powerful analysis tools being offered to consumers online. In fact, such a marriage of humans and computers could be a strong selling point for the financial services industry -- bridging consumers' reluctance to go it alone online with their desire for a human connection and the best possible performance for their investments. 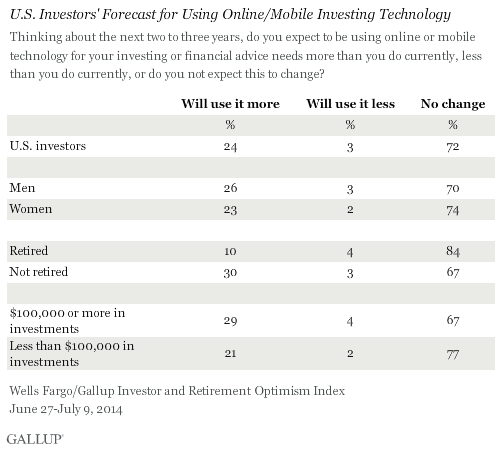 These findings are part of the Wells Fargo-Gallup Investor and Retirement Optimism Index, which was conducted June 27-July 9, 2014, by telephone. The sample for the Index included 1,036 investors, aged 18 and older, living in all 50 states and the District of Columbia. For this study, the American investor is defined as any person or spouse in a household with total savings and investments of $10,000 or more. About two in five American households have at least $10,000 in savings and investments in stocks, bonds, mutual funds, or in a self-directed IRA or 401(k). The sample consists of 72% nonretired investors and 28% retired investors. Questions about how investors get financial advice were asked of a random half-sample of 509 U.S. investors. The margin of sampling error for these results is ±5 percentage points at the 95% confidence level. The strong market gains since 2012 have not fully registered with most investors, as only 7% know stocks grew by 30% in 2013. Most investors say they would park a spare $10,000 in cash or a CD, rather than invest it in the market.